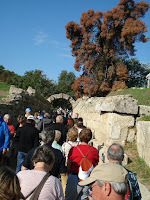 While at the port of Katakolon, Greece, we took an excursion to Olympia, site of the first Olympics that took place sometime around 600-700 B.C. An earthquake tumbled quite a bit of the columns in the temples. It must have been a big one since the sections of the columns indicate they were very large and heavy. 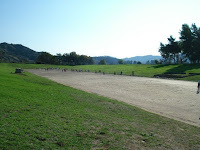 The stadium was like a shallow bowl with grassy sides. The area where the judges sat is still there and a "tunnel" much like the entryway of football stadiums is still there. 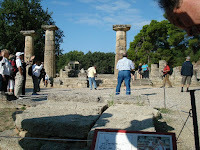 At the temple of Hera, the Olympic torch is lit for our modern day Olympics and begins its journey from here. The fire is started with rays of the sun on a mirrored bowl. Or at least it appears that way. If you watch this video, the fire starts awfully quickly. 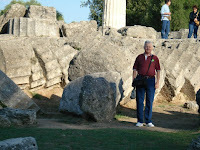 As I walked among the old temples, I was reminded of the scripture verses that talk of the temple of the unknown god in Athens--the one I think Paul refered to in Acts 17:22-31. Paul said God, the creator of heaven and earth, did not need a temple in which to liv e. Again, as in Rome, the thought played in my head, "My God is bigger than all of this." 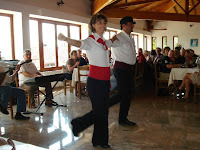 Once we were done touring Olympia, our final stop was at the Europa Hotel's banquet room wh ere we sampled Greek food and were entertained with lively Greek dancers. These people know how to party! A Scrapbook of Christmas Firsts--On tour in Rome!